At 4:15am on June 22 1941 Adolf Hitler launched his armies eastward in a massive invasion against the Soviet Union, Codename Operation Barbarossa. It was the largest military operation in history, three great army groups, involving more than 3 million Axis troops, 150 German divisions, and three thousand tanks smashed across the frontier into Soviet territory. The invasion covered a front from the North Cape to the Black Sea, a distance of two thousand miles. The Soviet Union must fight against the most powerful army, German combat effectiveness had reached its apogee; in training, doctrine, and fighting ability. 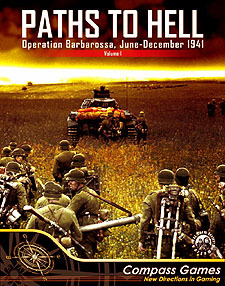 Paths of Hell recreates the events of those days and allows the players to reproduce the most famous battles of the Operation Barbarossa on the Eastern Front at a tactical level. Players take command of either the Soviet or Axis Forces (or can play solitaire) in the tactical battles of each scenario. Paths to Hell (PTH) is the new modules of the War Storm Series (WSS) moving from the West to the East Front. Based on the system used in PTH incorporates new and upgraded rules. The WSS promises many hours of fierce fighting between the infantry, tanks, artillery and aircraft belonging to the armies enveloped in this conflict. Just a few of the new additions include: Battalion rules/officers, Human wave attacks, Recon rules, Flamethrower tanks, Motorcycle recon, Waffen SS, Gulley, Amphibious tanks, SMG units, etc. PTH have a moderate complexity with good solitaire suitability. The system emphasizes the role of officers. Officers can activate units, coordinate with other officers and their units, call for artillery support, air support, smoke screens, influence moral checks, coordinate attacks, and much more. Rules for special actions. Based on the principle of simultaneous execution, or simply "WE GO", a hybrid system of turns, and "real time". The players must activate unit leaders to perform many actions (fire, assault, move, coordinate, etc.). A turn ends when both players have completed all their activations. The scale is company level with units representing groups of between 30 and 40 soldiers, weapons units represent groups of 3-4 weapons and their accompanying crews (20-25 soldiers), and the AFvs-Transports representing groups of 3-5 vehicles and their corrosponding crews. Scenarios are divided into turns about 12-15 minutes of action. Turns are divided into the followiong Phases: Command Phase, Initiative Phase, Activation Phase and Marker Removal Phase. The game uses isomorphic mapboards, each of which are aligned to any edge of equal length on any other mapboard. This allows for an almost unlimited number of combinations to create any terrain situation, including player designed scenarios. Each map hex represents a distance of approximately 150 to 200 metres. The series rules are easy to understand but each game's scenarios require a solid application of various strategies to win. The result is a good balance of fun, fast-paced, and exciting game play, using realistic game mechanics. WSS games are highly re-playable due to their variety of unit types, numerous scenarios, varying officer capabilities, and random officer selection, and therefore represent great value for your gaming buck.